Rachel Darvill’s primary passion is biodiversity conservation. She has been working as a biologist and environmental consultant since graduating with a BSc in Biology from the University of Victoria in 2000. 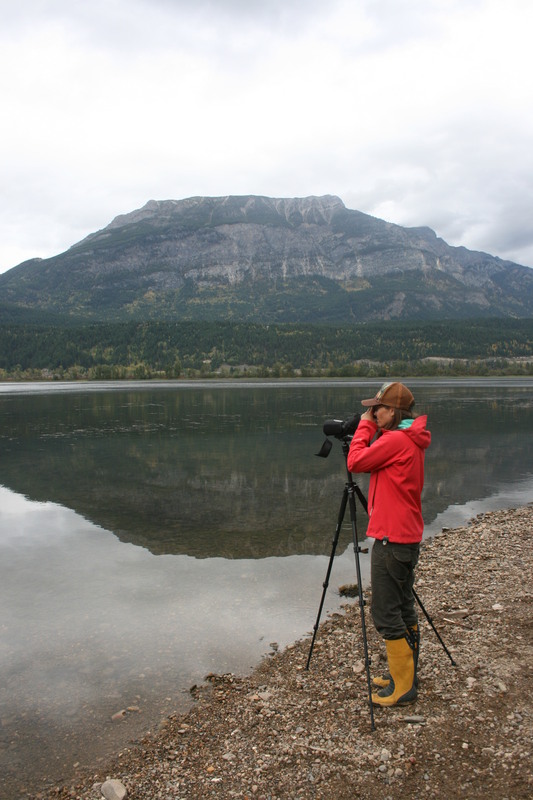 She is the primary consultant at Goldeneye Ecological Services and by working with several agencies such as Canadian Wildlife Service, Parks Canada and Wildsight, she has had extraordinary opportunities to study and help conserve wildlife. From working as a field biologist on remote seabird research programs on Triangle Island and Haida Gwaii, an elephant project in Tanzania, grizzly bear research in Alaska and Banff, Raven research in the Arctic and Washington State, to aquatic plants in the Columbia Headwaters and more, her field research skill set is indeed diverse. Most recently, Rachel developed a new 5-year citizen-science initiative entitled the Columbia Wetlands Waterbird Survey (CWWS). During the first round of surveys (Spring 2015), the program got 133 kids outside to birdwatch and saw 38 participants go to 64 locations throughout the Columbia Wetlands, enabling for over 14,000 individual birds to be recorded over three days, which amounted to 9 hours total! Rachel is hopeful that collecting bird baseline data will enable the Wetlands to acquire ‘Important Bird Area’ status; she also believes the CWWS will create additional long lasting benefits such as additional private land acquisition, educational opportunities and increased stewardship. Rachel completed her MSc in Environment and Management from Royal Roads in 2014 where she quantified stakeholder use of ecosystem services (ES) and mapped ES hotspot locations in the Peace River Valley, BC. She sits on the Board of the Columbia Wetlands Stewardship Partners, Wildsight Golden, and on the Columbia Basin Water Quality Monitoring Program’s Steering Committee where she leads the Upper Columbia Water Quality Monitoring Program.